There’re sometimes moments in which one needs relaxing, quiet environments and personalised experiences. This was one of them. 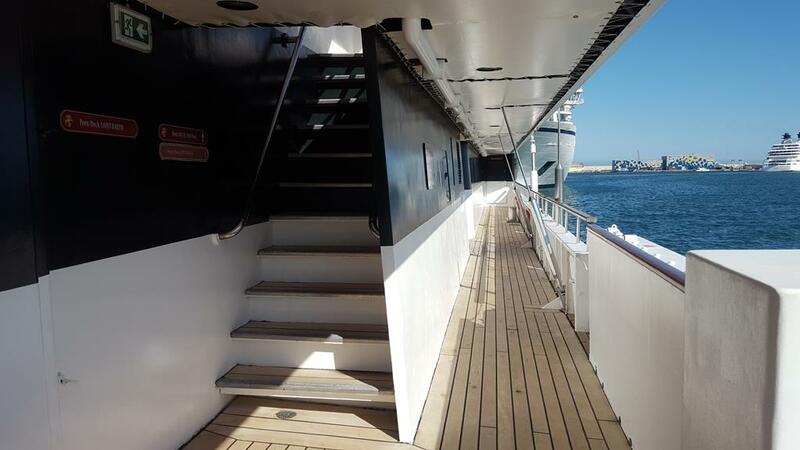 Having cruised Ponant Cruises many times, I got to the conclusion very soon, that it’s my type of cruising. Always delightful sailings but I wanted to get on the first ship of the company. The “baby” tall ship is the essence and origin of the company. A chic & european way of yacht cruising. 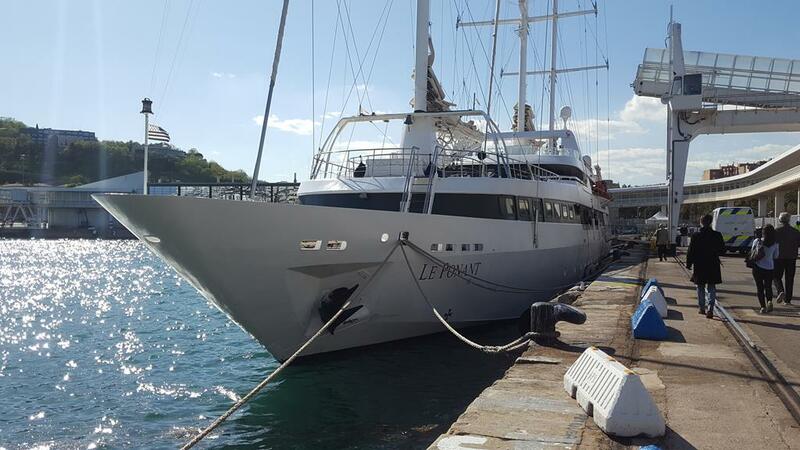 Just 64 passengers sailing peacefully in the sleek ship, like travelling on a private yacht but without buying one. I was feed up with big ships, busy ports, crowds of people. A friend of mine had vividly recommended me going up on the top deck, close my eyes and just listen to the sound of the winds on the sails. ¡Pure peace¡. 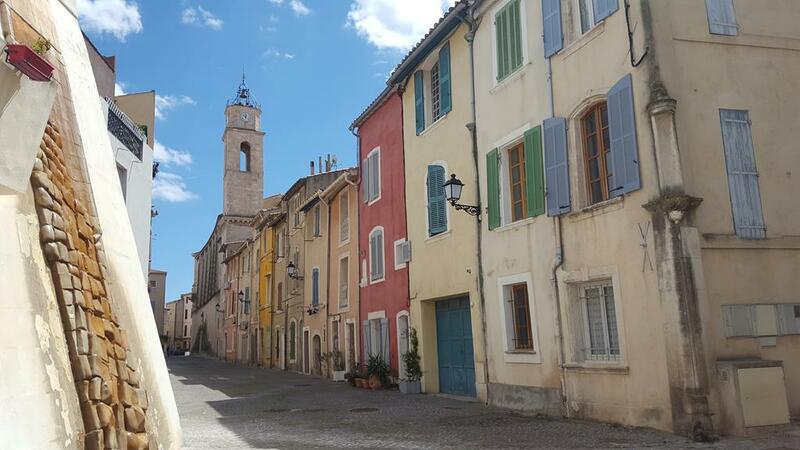 I chose a small sailing from Barcelona calling at Collioure, Marseilles, Porquerolles and getting off at Nice. It´s spring time and full expectations. Being aware it’s a smart casual “ship” I left my tuxedo in the closet, and run to the airport to get to Barcelona. It had rained but the sun was shining now. First a short domestic flight. 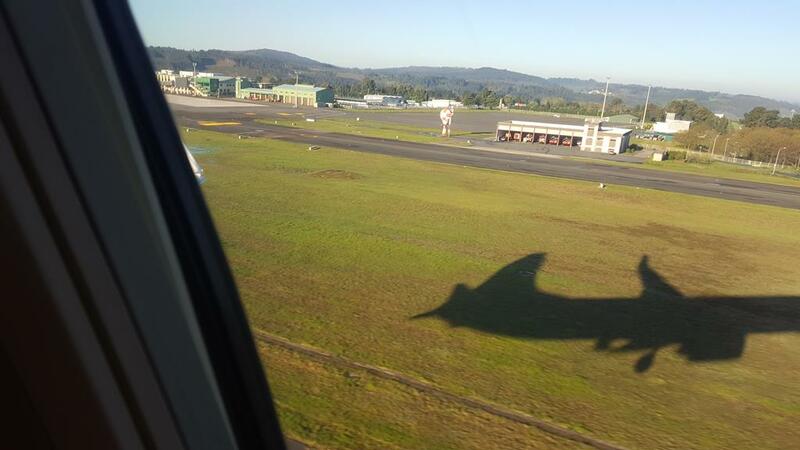 The shadow of the plane reflects on the green grass as it climbs. A little nap, snack on board and soon turns to Barcelona airport. I love approaches over the sea. Blue, calmed waters, sunny weather and from the air I could see the little ship moored at WTC, which is the closest port at downtown Barcelona. I have been in Barcelona many times. I didn’t feel like getting myself to the port, and be waiting until 17:00. 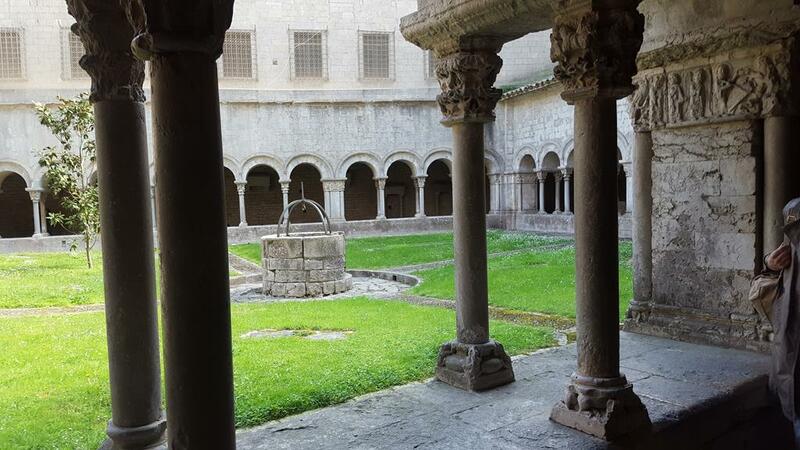 The city is usually packed, my travel agent had booked the airport transfer, because it included a typical meal at a tradicional Masía (countryside house), a quick visit of Sagrada Familia and a panoramic tour. 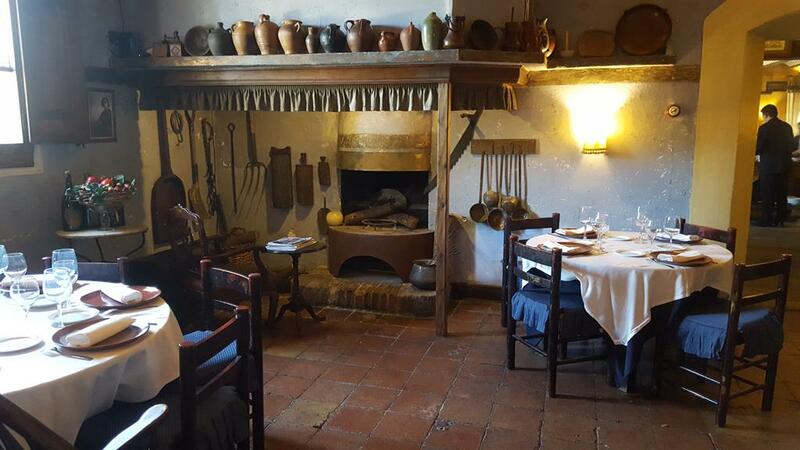 The place is awesome; traditionally decorated offers a good variety of regional specialities. 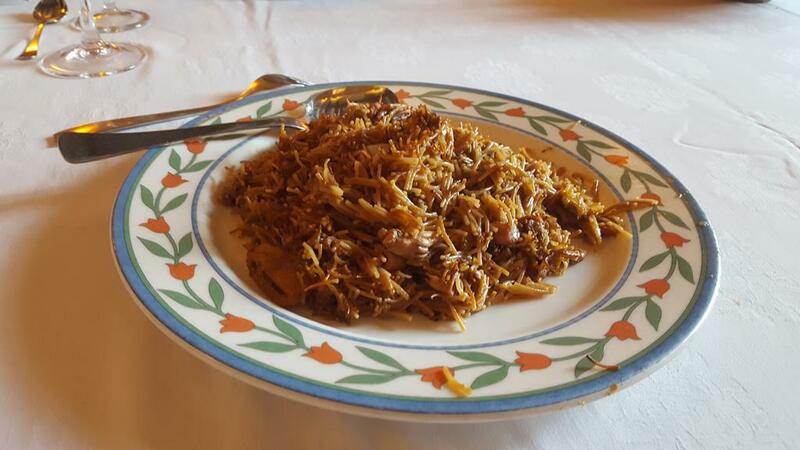 Fideua, escalivada appetisers (cold cuts, cheese, fuet, and so on). Entrée and a decent selection of desserts. Local wines and cava (our spanish champagne). 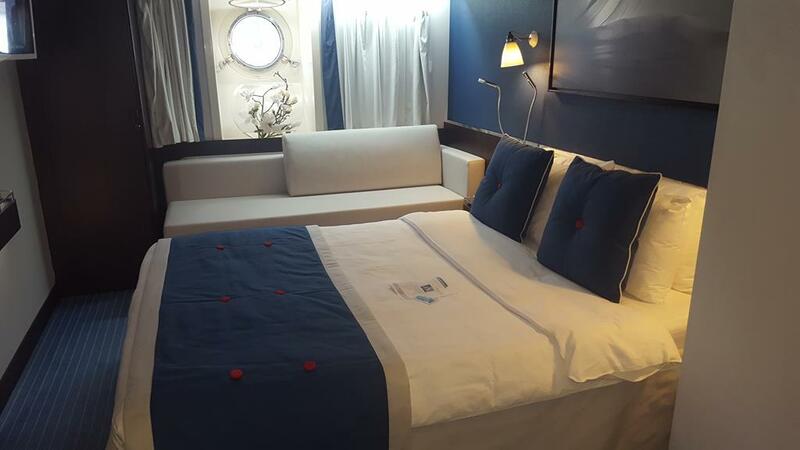 While there were, literally, thousands of passengers boarding on other ships, there’s not anything like on the tiny Le Ponant. A smiling french “garçon” walks with us the 150 m which separate the terminal and the yacht. The Captain and members of the crew stood at the gangway to shake hands and welcome each passenger. 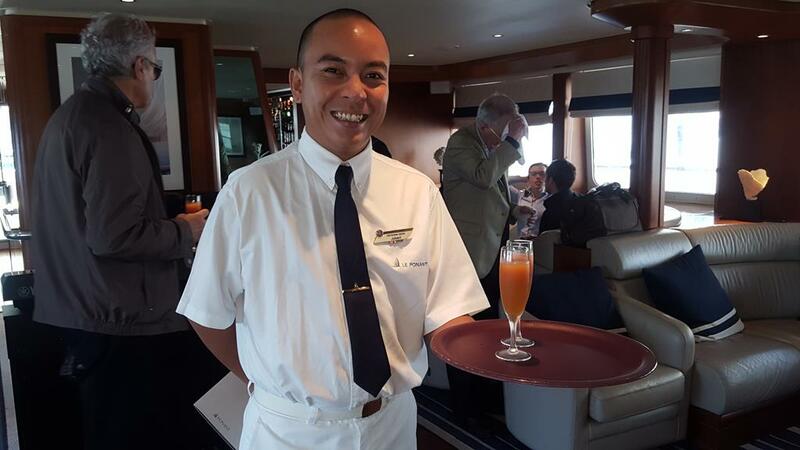 There’s a welcome cocktail in the only lounge of Le Ponant. Open Bar means “all included” during the cruise. Passengers included french, a few spanish and mostly europeans. Only 49 in total, as some cabins had been sold as singles. Zero supplement this time. Just 32, mostly located in the lowest deck (there are four of them). Decorated in blues and whites they are fairly large for a ship that small. Virtually the same size, they have superb matresses. Arrangements may vary: king sizes, twins and three beds. Decoration is smart, light and casual, with plenty of storage, large screen, minibar (no cost), Nespresso coffee machine and kettle. 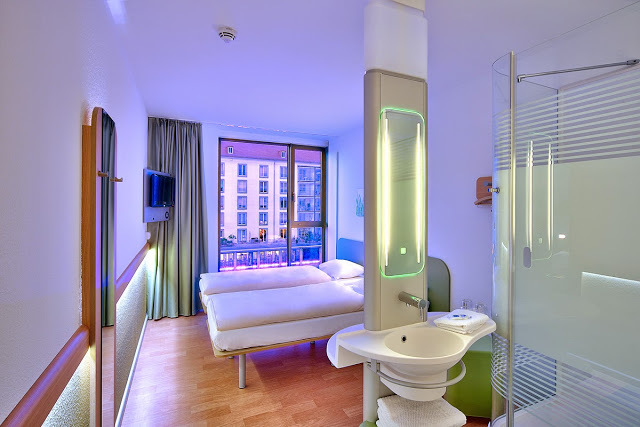 There´re also a hair dryer, and luxurious amenities by L’ Occitane. The bathroom is a bit small, but with a good size shower. We encountered a bit to swelling all the way. 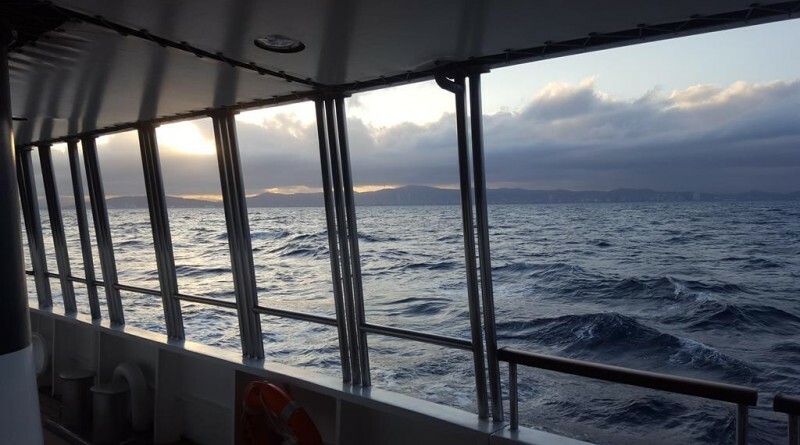 She was sailing in a force 6 seas most of the days, and the ship was pretty stable and behaved like a champ. Just a pleasant swelling. Five minutes is enough to walk around. Main lounge, bar, open space with access to the Marina, a delightful promenade, which gives access to the little restaurant. There´s a little library, and boutique. If we get to the upper deck, we can find an outdours buffet, and the bridge. And finally, the Sun Deck where you can watch the sails, or lying on the lounge chairs under the sun. The ship has a mixed combination of engine and sails (movable). Food on any Ponant ship is something serious. French cruise, fresh ingredients prepared individually. But I had been told that being on a 1500 tons little “thing”, would make the technique to be much more limited. The kitchen it´s pretty tiny. Food was going to be pleasant and honest, but more similar to a good Bistro, more than at luxury boutique ship. Don’t misunderstand me. Not bad, but not good enough. Standards at Le Boreal are heavenly. Simply food here needed a bit more seasoning and character. The lovely wood paneled Karukera Restaurant, is quaint. Leather chairs and decorative items taken from the South Seas. It offers “open seating” for everyone. But just one “two chairs” table; so you have to socialise. Or fight for this table. Breakfast and lunch are usually served “all fresco” at Le Diamant Restaurant in buffet style. There´s not a large list of selections but everything is fine. Crispy salads, good french fromages, appetisers and two or three hot entrees. A soup. Chocolate Mousse is almost perfect. Like in all Ponant ships. As far as lunch is concerned, less is more. 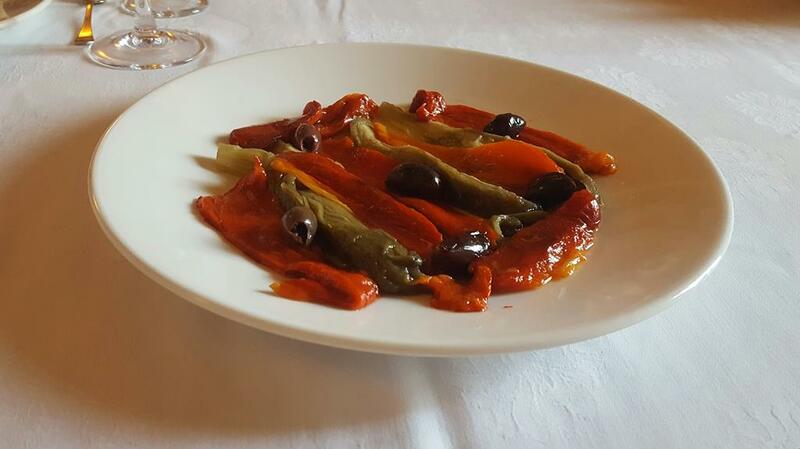 A small array of salads, appetizers, cold and hot main meals, but all perfect and delicious. Freshly baked bread and best quality food everywhere. There´s a small tea time where there are always sweet small bites, sandwitches, fresh juices and gourmet tea brands. Palamos is a small town in the Girona Province, north of Barcelona. It’s mainly the summer destination for middle class catalonians. The place hasn’t anything worth it except a beach next to the port, and local restaurants. There are dozens of sights around to visit. 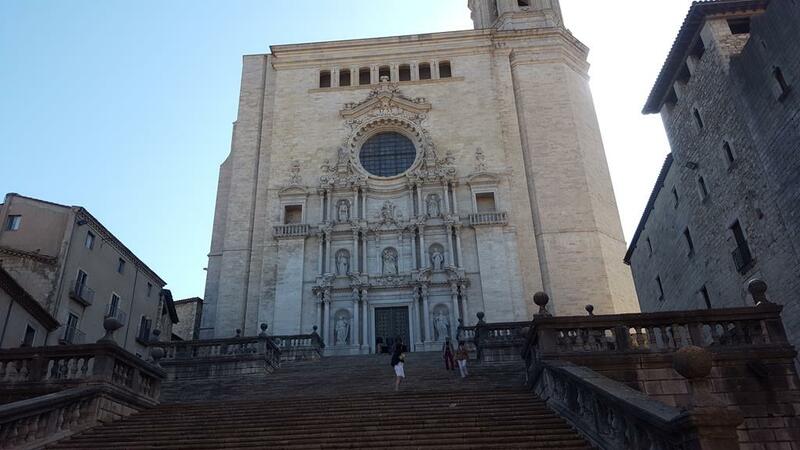 Due to the route disruption we were offered a free excursion to Girona. 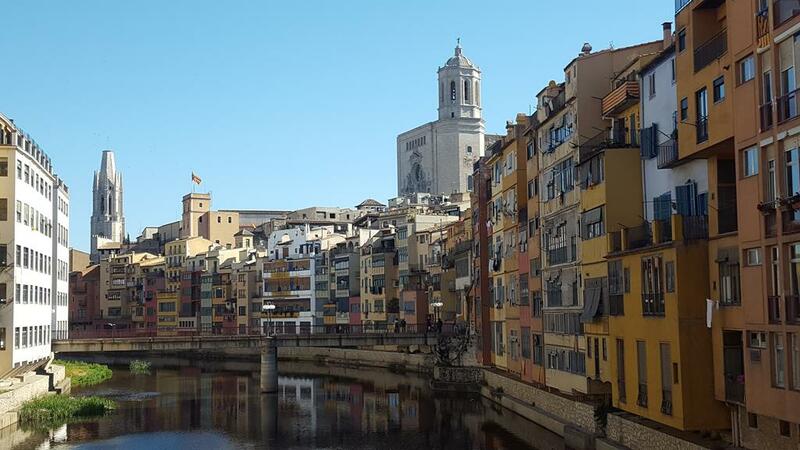 Girona looks like my hometown. Small, medieval with an almost intact old town between the gothic cathedral and the houses overlooking the river. Cobbled streets, pintoresque alleys and plenty of art, arched streets and traditional places to have a coffee. It has been chosen as a background for the new Game of Thrones film. 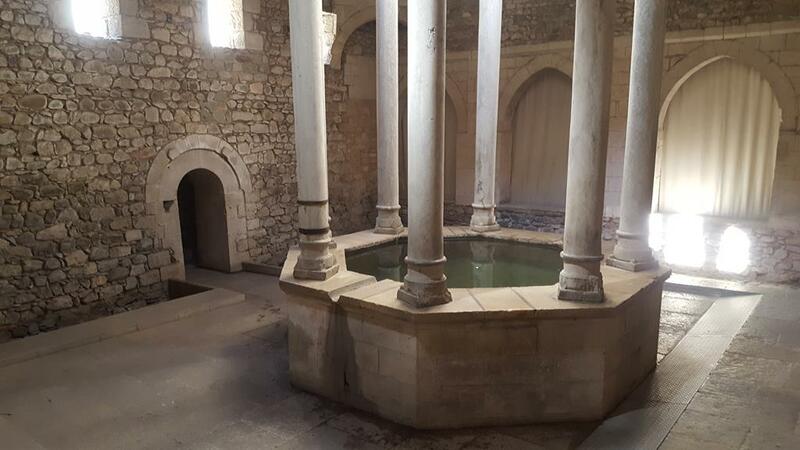 The cathedral and the old arab baths are awesome. Great to unwind and walk around. Marseille: We didn´t get into the old port as it was windy, but we berthed as closest as possible. 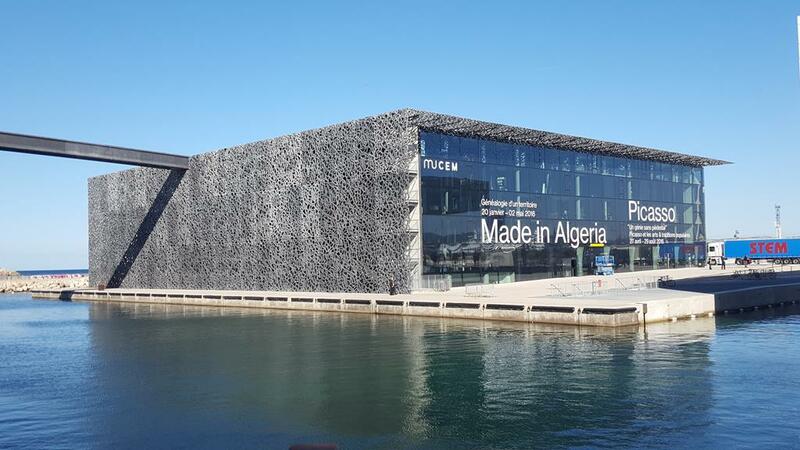 Next to Fort Saint Jean and the new MuCem, just 10 minutes walk from the old port. Privileges of sailing on a boutique ship. It gets as closest as downtown as possible. 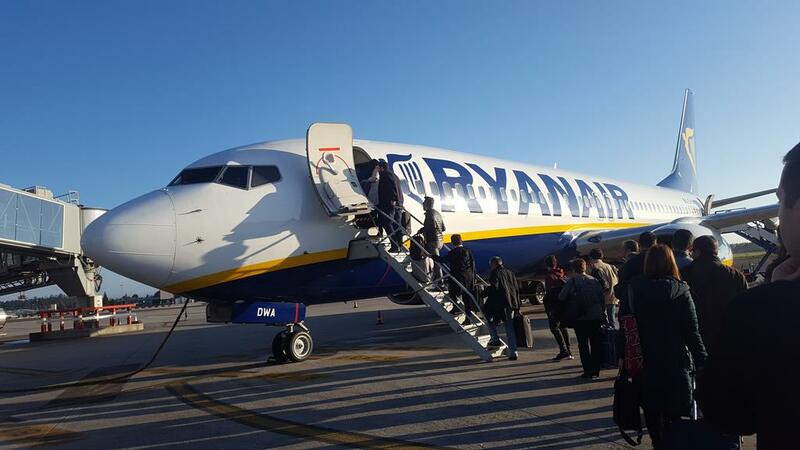 My first first plan was going to Avignon, but again another general strike. There was train disruptions. 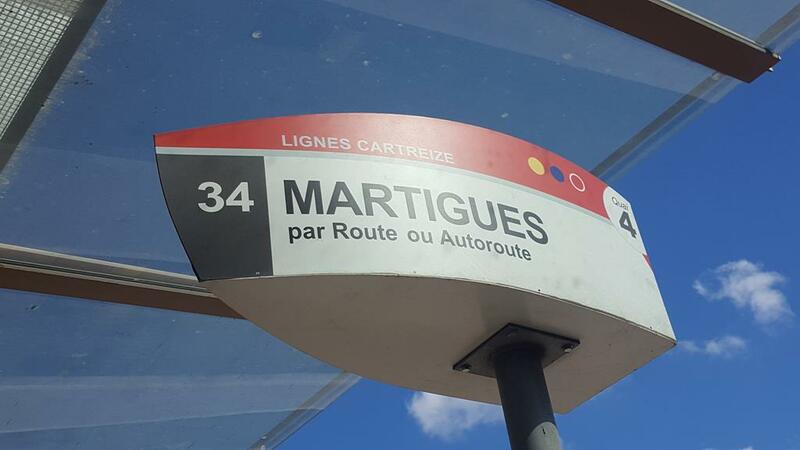 So the alternative plan was Martigues. 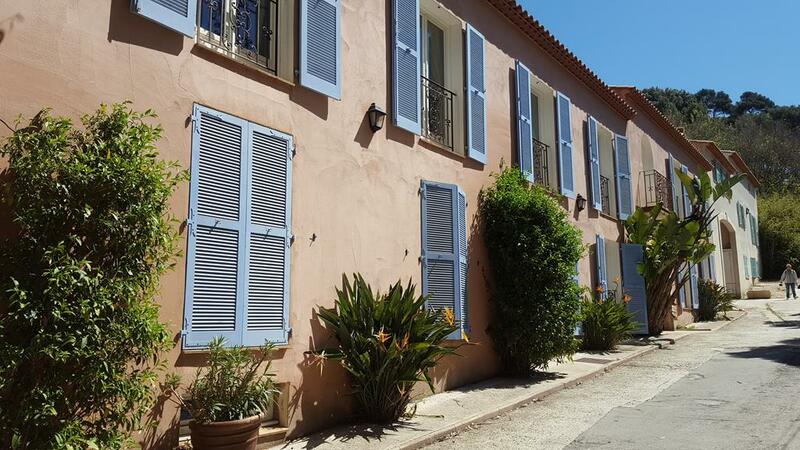 The Venice of Provence. Buses run normally. Walking to La Canabiere, underground to St Charles Station and bus 34. In 45 minutes, we arrived to this lovely place. 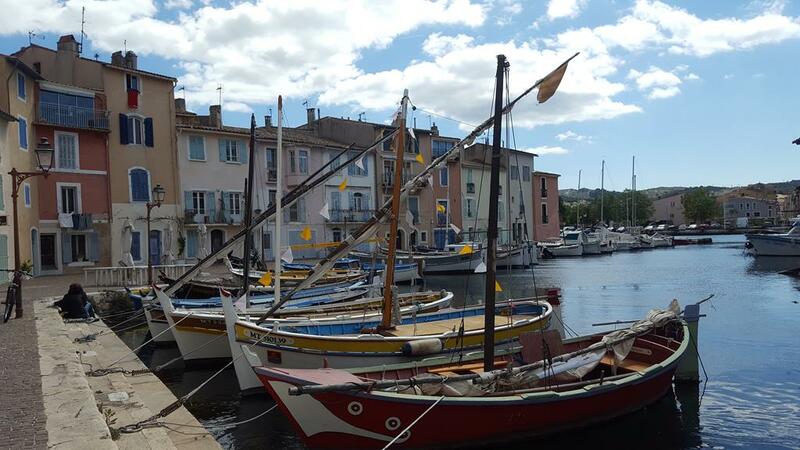 I didn´t expect Martigues to be that nice. No tourists. It was warm and had a wonderful exploration. 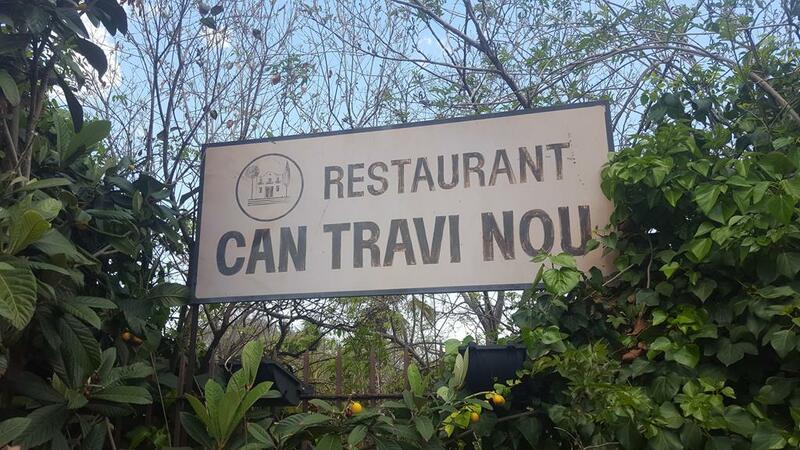 And a nice outdoors restaurant. 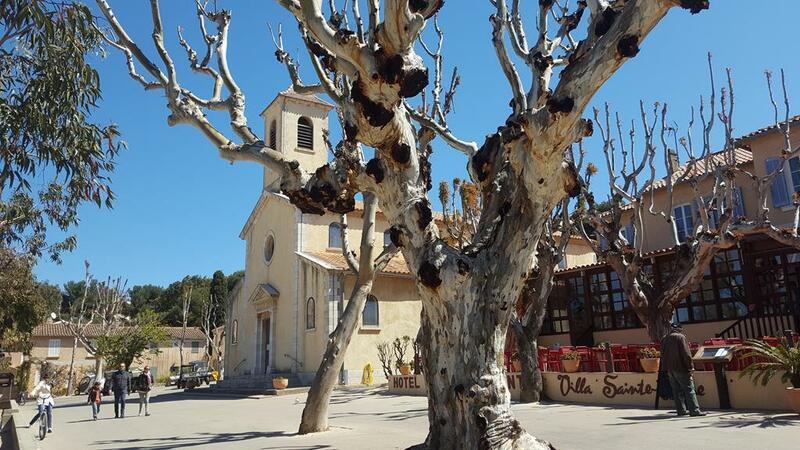 Menu du jour: moules (mussels) with wine sauce, soup provenzale, ile flotants overlooking a canal. Not too expensive: about 15 euros. The baguette was really delicious. I came back at 14:00, with plenty of free time as the ship sailed at 23:00. I walked down from the station to buy the most typical souvenir in Marseille. 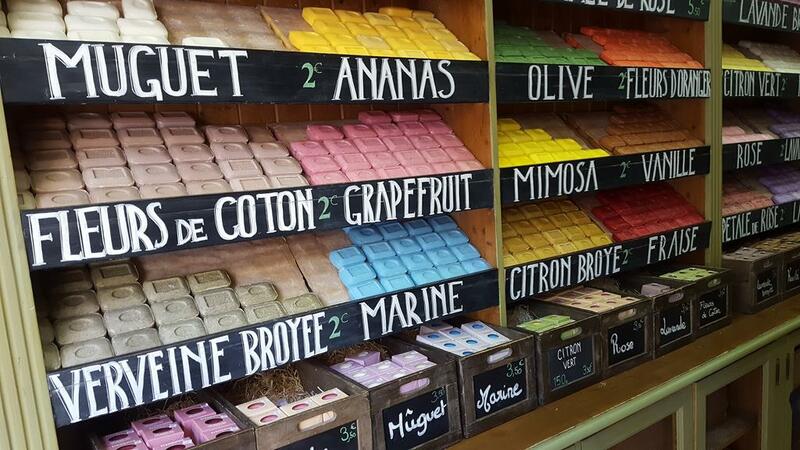 Artisan soap at Savonnerie de Marseille at la Canabiere. 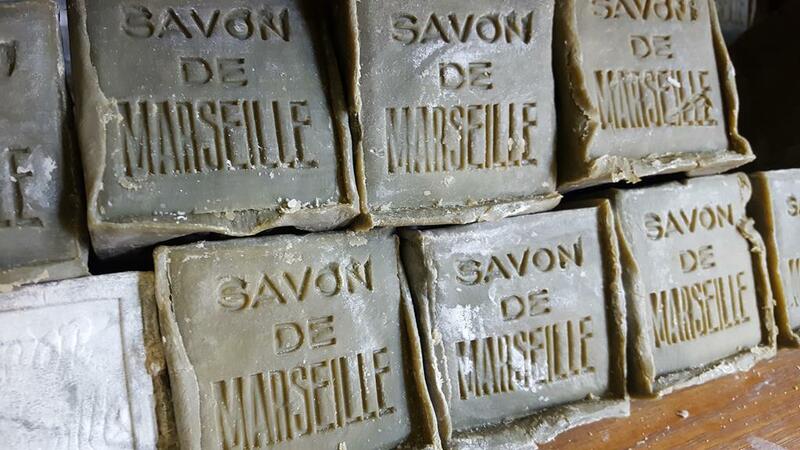 La Provence produces lovely ingredients to make one of the best soaps in the world. Lavander, olive oil, herbs, oranges….it should contain 72% of natural oils. After the walk I needed to relax. At the old port I suggest a Pastis at Samaritaine Café. One of the highlights of Marseille. Pastis is a kind of local anisette licor served with ice or/and water. Similar to Ouzo in Greece. I went back walking along the old town. Le Panier. Once a slum it’s now a boheme quartier full of charm and next to the port. 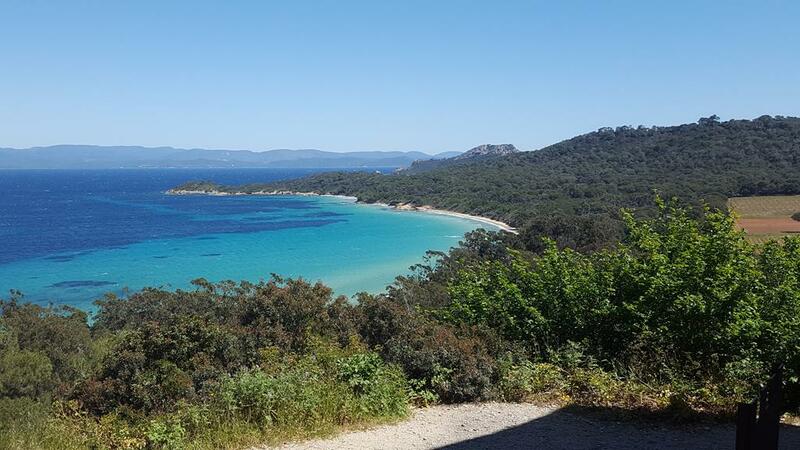 Porquerolles is a nature wonder, almost deserted. With just over 300 inhabitants, living in the little town around the port. Then greneries, forests, empty and pristine beaches. The island is only accesible by boat. We knew the seas was choppy. He tendered and used Le Ponant rafts. The guys at the crew did a good job avoiding the waves. We got wet but the wild ride was just fun. We hired bikes and got lost in the forests, went up the castle and enjoyed the Pentanque game organized by the crew. Local appetizers were served at midday. Indeed different experiences. 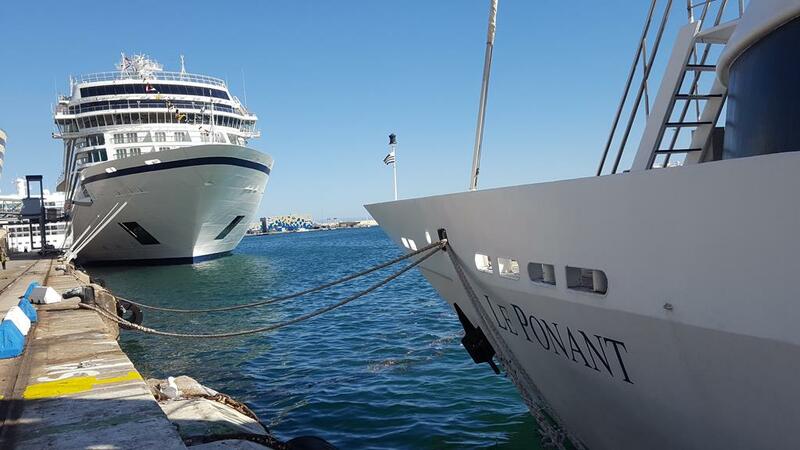 The little Le Ponant doesn´t need casinos, bingos or any noisy entertainment. Everything is casual and relaxed and with the destinations as the main focus. The main con is Sailing in a private environment, and in climate weathers using the Marina Deck to enjoy the sea. Kayak, swimming in the sea. She is able to berth in the most remote destinations. There´s a small sports program, and private activities organized ashore. It has a tiny library, and at night, music is always available. Sometimes piano concerts, karaoke or disco. The aim is to socialize in an intimate environment. Sometimes elegant cocktails are organized.